Christmas on Campus, in its first year, brought together the Loyola Community as well as the neighbors of Roger’s Park. Christmas on Campus is a Christmas-themed party here at Loyola for children 5-12 that may not have the means of having a Christams. Brought here by two St. Louis sophomores, Christmas on Campus promotes generosity and the holiday spirit by pairing Ramblers of with children and let them explore the Winter Wonderland created inside of Gentile. This year, over 400 Ramblers took part in the event. St. Xavier canned food drive is in its eigth year of operation. For the eight years, Loyola’s CLC (Christian Life Communities) scower the surrounding neighborhood in search of kind-hearted neighbors to donate canned food. These cans are then taken to Kentucky where the food is stored in a pantry that feeds the surrounding area for half a year. All in the name of giving. In the stunning Madonna Della Strada Chapel, the Loyola fine arts annex puts on a yearly concert showcasing their many talented musicians. Featuring woodwinds, bass drums, handbells and many other symphony instruments, this is Loyola musical production at its finest. Loyola’s Joyola is a long-standing tradition that gives a chance for the Loyola accapella groups show off their glorious voices in front of the student body. The Acafellas, Silhouettes and Loyolacappela all come together to put on a ear-pleasing harmony of music. This all takes place in Mundeline Auditorium. Four days before Christmas, the staff, faculty and retirees will be treated to a Christmas meal. Hosted by school president, Fr. Michael Garanzini SJ, the luncheon will feature games, prizes and great food. Ever since coming to Loyola though I have found myself volunteering much more for no reason other than I just want to. Why the sudden change you ask? Well I attribute most of it to the amazing friends I have made in college. My friends are constantly brainstorming new ideas for service work such as mission trips, fundraisers, and how to recruit people to help out at the soup kitchens. Christmas On Campus was one of these events that my friends founded and somehow convinced me to help out with. It was this past Saturday and it was such a success! This was the first annual Christmas On Campus so no one knew exactly what to expect. How many kids will show up? How often should we have a group perform on stage? Will the Loyola student volunteers ditch? How are we going to deal with upset children? These, along with countless others, were all questions we were asking ourselves up until about 11:00 a.m. Saturday when the volunteers started arriving. To my surprise everything went very smoothly and we had tons of people come out for the event! The gym was full of awesome Christmas decorations (which we had stayed up till 3 the night before putting up) and the children looked so happy. I will admit, Friday night at about 2:00 a.m. after about 4 hours of decorating and setting up I was questioning my decision to join my friends in administrating this project. It was taking a lot of time and effort that I easily could have put into school work or other leisure activities. Once Saturday morning came around though, I knew I was grateful for the opportunity to help with the event. The Christmas cheer that I saw in these children’s faces and the enjoyment of everyone in the gym was amazing. It was the coolest feeling to know that I helped make it possible. I am already looking forward to Christmas On Campus next year and have some ideas on how to improve it! 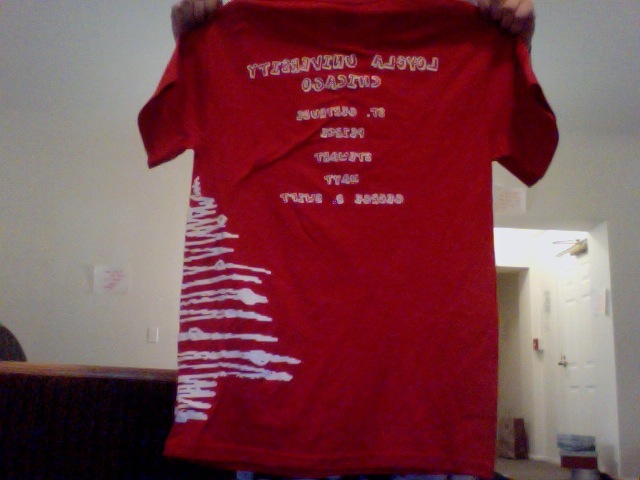 What’s Better Than Free T-Shirts? 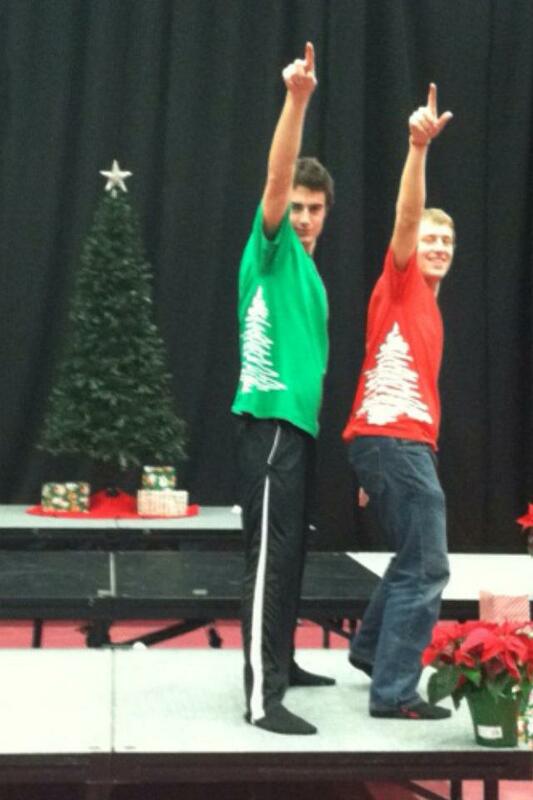 Our Christmas On Campus shirts have come in! Dr. Kelly, the vice president of student affairs, was extraordinarily generous and donated a total of about 600 shirts to our event! 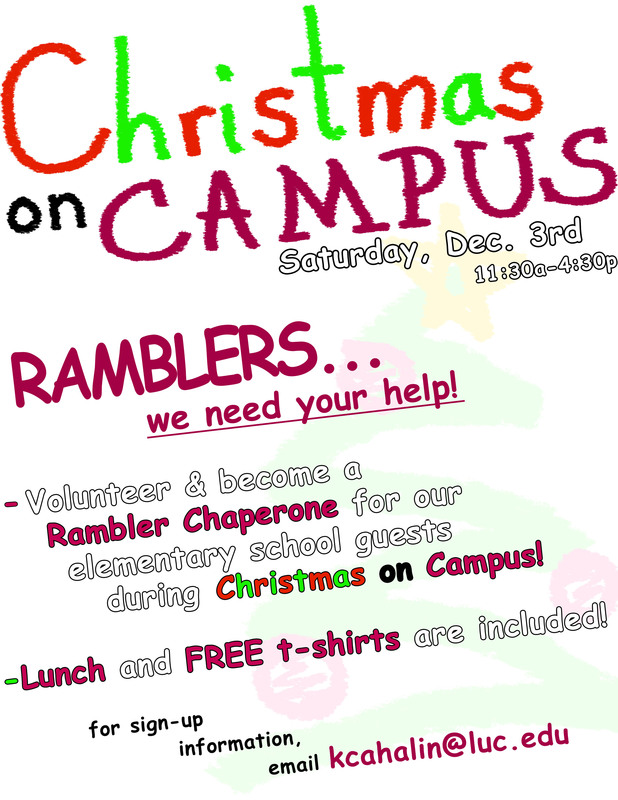 This means that all Loyola volunteers and all children attending Christmas On Campus get a free t-shirt! The back of the shirts say, “Loyola University Chicago” followed by a list of the schools that children are coming from. There is also a Christmas tree on the side. Our Christmas On Campus t-shirts! We’re back from Thanksgiving break and life seems to be more hectic than ever! With final exams in two and a half weeks and many final papers to turn in before then, time management is essential to survive the crazy month of December. Unfortunately, just because finals are coming up it doesn’t mean that other commitments and responsibilities no longer exist. 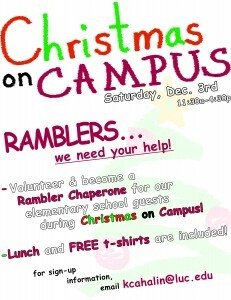 One such commitment for me is our Christmas On Campus event this coming Saturday! 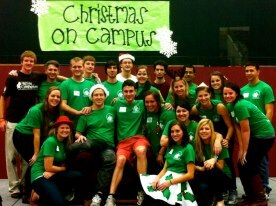 This year is Loyola’s first annual Christmas On Campus. Founded by Loyola students Nic Herman and Alex Boesch, it is an event dedicated to bringing Christmas cheer to elementary students in Loyola’s neighboring communities. Being a close friend of Nic and Alex’s, they presented me with the opportunity to be on a team of six Loyola students who would individually be in charge of different aspects of the event in order to get everything running smoothly. I am in charge of getting about 150 Loyola student volunteers. These volunteers will be paired up with a child and they will basically hang out with them for the day. The event will be held in the Norville Center and the newly redone Gentile gym. We have different clubs and organizations from Loyola setting up booths for the children such as gourmet hot chocolate making and ornament decorating. Santa will make an appearance and singing and dancing groups from Loyola will perform. None of this would be possible, however, without the help of the University. Nic and Alex worked closely with the Jesuits at Loyola and got their support for the event. They then went to higher administration and worked on getting the space and permission we needed. Although it has involved a good amount of work, it will definitely be worth it to share Christmas cheer with the elementary students on Saturday. After all, isn’t that happiness the best part of the holidays? I think so. The Official Flyer for Christmas On Campus! 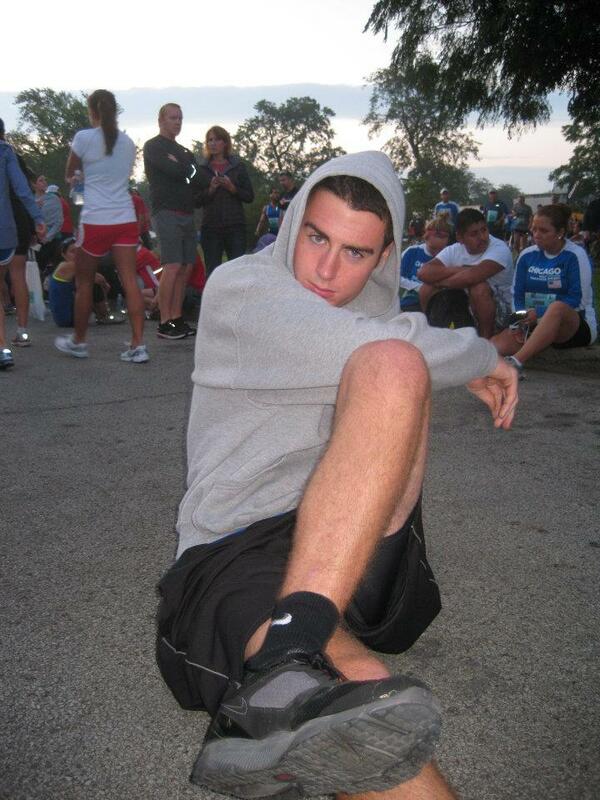 For all interested readers, my name is Nic Herrmann and I am a sophomore here at Loyola University Chicago. Currently I am studying Communication with hopes of working in the non-profit sector upon completion graduation. I suppose I should explain why I am here at Chicago, because after all, there are many universities to choose from. As a native St. Louisan, Chicago has always been a metaphorical neighbor to me. No more than four and a half hours away, I can remember many times travelling up here to meet my grandma (who lives in the suburbs) and visit this great city. With many fond memories to speak of, Chicago was a natural fit for college, and couple those memories with the desire to go to a big city Jesuit University, Chicago comes out as the obvious winner. As a student here, I take part in many activities. For one, I am planning on an event called Christmas on Campus; a Christmas gathering full of games and activities for local children to enjoy. This event functions as a way to interact with and serve the neighboring community. I am also a member of the Catholic Student Organization. With a background in Jesuit education since freshman year in high school, Ignatian Spirituality is something I have grown accustom to and fond of. These formal Loyola activities take up a lot of my time, but in my free time I thoroughly enjoy throwing the frisbee, reading and jogging. In fact, I ran one of the many half-marathons this city has to offer. Another hobby of mine is discovering new places and venues in this expansive city. Though familiar with the city, I am certainly no expert on all of the exciting opportunities this place has to offer. My list of places in the city grows daily and I am always on the look-out for the new hidden gem.